The Big Short is a 2015 American comedy-drama film directed by Adam McKay and written by McKay and Charles Randolph, based on the 2010 book The Big Short: Inside the Doomsday Machine by Michael Lewis about the financial crisis of 2007–2008 which triggered by the United States housing bubble. The film stars Christian Bale, Steve Carell, Ryan Gosling, Brad Pitt, Melissa Leo, Hamish Linklater, John Magaro, Rafe Spall, Jeremy Strong, Finn Wittrock and Marisa Tomei. The film is noted for the unconventional techniques it employs to explain complex financial instruments: among others, cameo appearances by Margot Robbie, Anthony Bourdain, Selena Gomez and Richard Thaler, who explain concepts such as subprime mortgages and collateralized debt obligations as a meta-reference. Several other actors also break the fourth wall, most frequently Gosling, who serves as the narrator. The film began a limited release in the United States on December 11, 2015, followed by a wide release on December 23 by Paramount Pictures The film was a financial and critical success, grossing $133 million against a $28 million budget, and receiving positive reviews. The film was nominated for five Academy Awards, including Best Picture, Best Director, Best Supporting Actor for Bale and Best Adapted Screenplay, winning the latter. In 2005, eccentric hedge fund manager Michael Burry (Christian Bale) discovers that the United States housing market is extremely unstable, being based on high-risk subprime loans. Anticipating that the market will collapse during Q2 2007, as interest rates would rise from adjustable-rate mortgages, he envisions an opportunity to profit. His plan is to create a credit default swap market, allowing him to bet against market-based mortgage-backed securities. He proposes his idea to several major investment and commercial banks who readily accept. Burry's huge long-term bet, exceeding $1 billion, entails paying substantial monthly premiums to the banks. This proviso incurs his clients' ire, believing he is "wasting" capital, and many demand that he reverse and sell, but Burry refuses. He later discovers that the banks collude with a major bond-rating company to maintain ratings on worthless bonds, allowing them to sell off their losing positions before the true values became known. Under pressure, Burry restricts withdrawals from his fund, angering his investors. Eventually the housing market collapses and his fund's value increases by 489% with an overall profit of over $2.5 billion, but the backlash he receives, coupled with self-disgust, convinces him to close his fund. Salesman Jared Vennett (Ryan Gosling) is one of the first to understand Burry's analysis, learning about his actions from one of the bankers that sold Burry an early credit default swap. Vennett uses his quant to verify that Burry's predictions are likely true and decides to put his own stake in the market, earning a fee on selling the swaps to firms who'll be profitable when the underlying mortgage bonds fail. A misplaced phone call alerts hedge fund manager Mark Baum (Steve Carell) to his plans, convinced to buy credit default swaps from Vennett due to his own personal distaste with the banks. Vennett explains that the market collapse is being further perpetuated by the packaging of subprime loans into collateralized debt obligations (CDOs) large enough to be considered AAA ratings. Baum sends staff to investigate the Miami housing market and they discover that mortgage brokers are making money by selling risky mortgages to the Wall Street banks, which created the bubble. In early 2007, these loans begin to default, but the prices of the CDOs somehow rose. Meanwhile, ratings agencies refused to downgrade the ratings of these failing bonds. When Baum questions an acquaintance at Standard & Poor's, he discovers conflict of interest and dishonesty amongst the credit rating agencies. When Baum's employees question Vennett's motives, he maintains position and invites Baum and his team to the American Securitization Forum in Las Vegas. Baum interviews CDO manager Wing Chau, who creates CDOs on behalf of an investment bank, claiming to represent the interests of investors. Chau describes how synthetic CDOs make a chain of increasingly large bets on the faulty loans, involving up to 20 times as much money as the loans themselves. Baum horrifyingly realizes that the fraud will completely collapse the global economy and decides to purchase as many swaps as possible, profiting from the situation at the banks' expense. Waiting until the last minute to sell their position, Baum's fund makes a profit of $1 billion, but he laments that the banks won't accept blame for the crisis. Young investors Charlie Geller (John Magaro) and Jamie Shipley (Finn Wittrock) accidentally discover a prospectus by Vennett, convincing them to become involved in the swaps, as it fits their strategy of buying cheap insurance with big potential payouts. Since they are below the capital threshold for an ISDA Master Agreement required to enter into trades like Burry's and Baum's, they enlist the aid of retired securities trader Ben Rickert (Brad Pitt). When the bond values and CDOs rise despite defaults, Geller suspects the banks of committing fraud. The three also visit the American Securitization Forum, where they learn that the U.S. Securities and Exchange Commission has no regulations to monitor mortgage-backed security activity. They manage to successfully make an even more profitable payout deal than other hedge funds by shorting the higher-rated mortgage securities. These securities were considered highly stable and the banks were willing to sell swaps on them extremely cheaply. Geller and Shipley are initially ecstatic, but Rickert is disgusted, pointing out an impending economic collapse and that a 1% rise in the unemployment rate is tied to 40,000 deaths. The two are horrified, taking an emotional stake in the collapse by trying to tip off the press and their families about the upcoming disaster and the rampant fraud amongst the big banks. Ultimately, they profit immensely but their faith in the system is broken. In the epilogue, the fate of the main characters are told: Jared Vennett makes $47 million off the selling of swaps. Mark Baum becomes more gracious from the financial fallout, and his staff continue to operate their fund. Charlie Geller and Jamie Shipley go separate ways after failing to sue the ratings agencies, with Charlie moving to Charlotte to start a family, and Jamie still running their fund. Michael Burry decides to invest in water commodities. It's then noted that banks are selling CDOs again under a new label: "bespoke tranche opportunity". Christian Bale as Michael Burry, M.D. In 2013, Paramount acquired the rights to the 2010 non-fiction book The Big Short: Inside the Doomsday Machine by Michael Lewis, to develop it into a film, which Brad Pitt's Plan B Entertainment would produce. On March 24, 2014, Adam McKay was hired to write and direct a film about the housing and economic bubble. Screenwriter Charles Randolph, who co-wrote the film with McKay, said one of the first challenges was finding the right tone for the film. He told Creative Screenwriting, "In general it was trying to find the right tone that was slightly funnier than your average Miloš Forman comedy, which is all grounded character-based but not so satirical where you got Wag the Dog. Somewhere between there was what I was shooting for. Once I got the tone down, then I went through the plot. The market's movements provided you with an underlying plot. You make your short deal, then the bank is trying to squeeze you out, and then it all breaks loose. So that was pretty easy, and it provided character arcs against that." Two years after Randolph wrote his draft, McKay, as director, rewrote Randolph's screenplay. It was McKay's idea to include the celebrity cameos in the film to explain the financial concepts. On January 13, 2015, Variety reported that Brad Pitt, Christian Bale, and Ryan Gosling were set to star in the film, with Pitt producing the film along with Dede Gardner and Jeremy Kleiner. Plan B Entertainment would finance, with Paramount handling the distribution rights. Before this, Pitt had already starred in the adaptation of the author's Moneyball, for which he was nominated for an Oscar. On January 14, it was announced that Steve Carell would also star. On April 21, 2015, more cast was revealed by Deadline, including Melissa Leo, Marisa Tomei, Tracy Letts, Hamish Linklater, John Magaro, Byron Mann, Rafe Spall, Jeremy Strong, and Finn Wittrock. Charles Randolph wrote the initial draft. Max Greenfield joined the ensemble cast of the film on April 23, 2015. Karen Gillan tweeted about her involvement in the film on May 8, 2015. Principal photography on the film began on March 18, 2015 in New Orleans, Louisiana. On March 25, filming was taking place on General De Gaulle Boulevard in the Algiers section of New Orleans. On May 8, Gillan confirmed she was shooting her scenes. On May 20, 2015, filming took place on Mercer, between Prince Street and Spring Street in Manhattan, New York City. On May 22, the production crew recreated the offices of failed investment firm Lehman Brothers in the lobby of the New York State Department of Financial Services in Manhattan. An assistant counsel for the Department of Financial Services played one of the extras in the scene. On September 22, 2015, Paramount set the film for a limited release on December 11, 2015 and a wide release on December 23, 2015. The film was released on DVD and Blu-ray on March 15, 2016. The Big Short grossed $70.3 million in North America and $63.1 million in other territories for a worldwide total of $133.3 million, against a budget of $28 million. The film was released in eight theaters in Los Angeles, New York, San Francisco and Chicago on December 11, 2015 and earned $705,527 (an average of $88,191 per theater). It set the record for the best ever per-screen gross for a film opening in eight locations, breaking the previous record held by Memoirs of a Geisha ($85,313 per theater), and was the third biggest theater average of 2015 behind the four screen debuts of Steve Jobs ($130,000) and The Revenant ($118,640). The film had its wide release on Wednesday December 23, 2015 and grossed $2.3 million on its first day. In its opening weekend it grossed $10.5 million, finishing 6th at the box office. The Big Short has received positive reviews from critics, with the screenplay, direction, and the performances of Bale and Carell receiving strong praise. On Rotten Tomatoes, the film has a rating of 88%, based on 266 reviews, with an average rating of 7.8/10. The website's consensus reads, "The Big Short approaches a serious, complicated subject with an impressive attention to detail – and manages to deliver a well-acted, scathingly funny indictment of its real-life villains in the bargain." On Metacritic, the film has a score of 81 out of 100, based on 45 critics, indicating "universal acclaim." Audiences polled by CinemaScore gave the film an average grade of "A–" on an A+ to F scale. IGN gave the film a score of 8.6/10, praising its "energetic direction" and making "a complicated tale palpable for the layperson even as it triggers outrage at the fatcats who helped cause it." 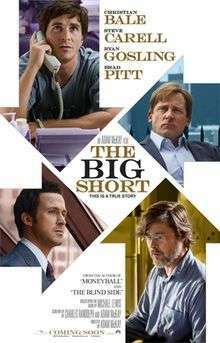 The New York Times's "UpShot" series stated The Big Short offered the "strongest film explanation of the global financial crisis". Vermont senator and 2016 presidential candidate Bernie Sanders endorsed The Big Short as an "excellent film". ↑ "THE BIG SHORT (15)". British Board of Film Classification. November 9, 2015. Retrieved November 9, 2015. ↑ Thompson, Anne. "AFI FEST REVIEW: 'The Big Short' Is Smart Expose of Financial Meltdown". Thompson on Hollywood. Indiewire. Retrieved 18 November 2015. 1 2 "The Big Short (2015)". Box Office Mojo. Retrieved May 22, 2016. 1 2 3 "Paramount Taps 'Anchorman' Helmer Adam McKay To Adapt And Direct Michael Lewis' 'The Big Short' About Economic Meltdown". deadline.com. March 24, 2014. Retrieved April 18, 2015. 1 2 3 4 5 Finely, Dash (December 16, 2015). "The Big Secrets Of The Big Short: How Unexpected Cameos Impact The Year's Must-See Film". MoviePilot.com. Retrieved December 27, 2015. ↑ "Paramount pushes 'The Big Short' into awards season". Associated Press. September 25, 2015. ↑ "The Big Short | Trailer & Movie Site | December 2015". The Big Short. Retrieved 2015-12-26. ↑ "How to Invest in Water Like Dr. Michael Burry from the Big Short". Vintage Value Investing. 1 2 3 4 5 Kit, Borys (January 14, 2015). "Steve Carell in Talks to Join Christian Bale, Ryan Gosling in 'The Big Short'". hollywoodreporter.com. Retrieved January 15, 2015. 1 2 3 "The True Story Behind The Big Short". History vs Hollywood. Retrieved 26 January 2016. 1 2 3 "Karen Gillan on Twitter". Twitter. Retrieved May 21, 2015. 1 2 "Max Greenfield Joins Brad Pitt, Ryan Gosling in 'The Big Short' (EXCLUSIVE)". Variety. April 23, 2015. Retrieved April 23, 2015. ↑ Staff, THR (2 December 2015). "'The Big Short' Director Adam McKay on Billy Magnussen Shrinking Steve Carell's Wardrobe". The Hollywood Reporter. Retrieved 26 January 2016. ↑ "The Big Short Somehow Makes Subprime Mortgages Entertaining". Wired.com. December 11, 2015. Retrieved December 30, 2015. ↑ McNary, Dave (March 24, 2014). "'Anchorman's' Adam McKay Boards Financial Drama". variety.com. Retrieved April 18, 2015. 1 2 Hogan, Brianne (January 20, 2016). "Banking on The Big Short". Creative Screenwriting. Retrieved January 21, 2016. 1 2 Justin Kroll (January 13, 2015). "Brad Pitt, Christian Bale and Ryan Gosling to Star in Financial Drama 'The Big Short' (EXCLUSIVE)". Variety. Retrieved January 14, 2015. 1 2 Fleming Jr, Mike (April 21, 2015). "'The Big Short' Solidifies With Christian Bale, Steve Carell, Ryan Gosling, Brad Pitt". deadline.com. Retrieved May 21, 2015. ↑ "Brad Pitt, Ryan Gosling, & Christian Bale are headed to Orleans for 'The Big Short'". onlocationvacations.com. February 10, 2015. Retrieved February 13, 2015. ↑ "'The Big Short', starring Brad Pitt, Ryan Gosling, & Christian Bale, begins filming in New Orleans". onlocationvacations.com. March 23, 2015. Retrieved March 29, 2015. ↑ "'The Big Short', starring Brad Pitt Ryan Gosling & Christian Bale, filming in Algiers, LA today". onlocationvacations.com. March 25, 2015. Retrieved March 29, 2015. ↑ "'The Big Short', starring Brad Pitt and Ryan Gosling, is filming in NYC this week!". onlocationvacations.com. May 16, 2015. Retrieved May 22, 2015. 1 2 Matthews, Christopher M. (22 May 2015). "'Big Short' Recreates Lehman Bros. Offices in Regulator's Building". The Wall Street Journal. Retrieved 25 May 2015. ↑ "Paramount pushes 'The Big Short' into awards season". CNS News. ↑ "The Big Short Website". Paramount Pictures. ↑ Pamela McClintock (December 13, 2015). "Box Office: Ron Howard's 'Heart of the Sea' Capsizes With $11M U.S. Debut". The Hollywood Reporter. Retrieved December 13, 2015. ↑ Scott Mendelson (December 13, 2015). "Box Office: 'In The Heart Of The Sea' Is A Whale Of A Fail, 'Big Short' Strikes It Rich". Forbes. Retrieved December 13, 2015. 1 2 "'Daddy', 'Joy' & 'Hateful Eight' Reap Fortune As 'Star Wars' Halo Effect Impacts B.O…Can 'Force Awakens' Hit $1 Billion In U.S.?". deadline.com. ↑ "The Big Short reviews". Rotten Tomatoes. Retrieved January 20, 2016. ↑ "The Big Short reviews". Metacritic. Retrieved January 19, 2016. ↑ "The Big Short Review - IGN". IGN. Retrieved 2015-12-26. ↑ Irwin, Neil (December 23, 2015). "What 'The Big Short' Gets Right, and Wrong, About the Housing Bubble". New York Times. Retrieved December 27, 2015.